Following on from the success of the The Secret Tea Society Cocktail (click here for details) , my involvement with the wonderful world of tea has carried on apace and I was recently commissioned to create a bespoke cocktail for a lovely company, based in Bath who create vintage style tea party events. 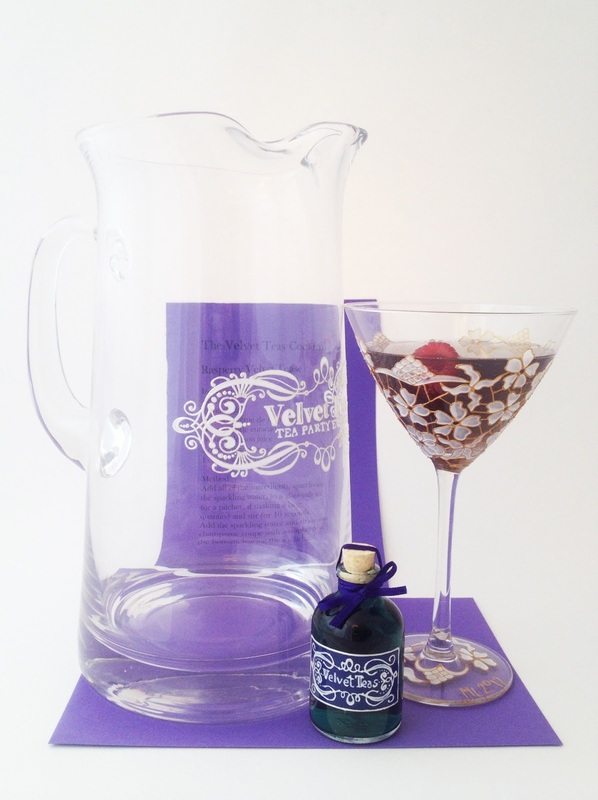 Velvet Teas is run by the delightful Emma Reynolds and was born of a love of fine china, beautiful linens and the exquisite pleasure of wonderfully sumptuous afternoon tea. Her tea party events already boast a selection of delicious sounding menus and Velvet Teas work with clients to provide the perfect tea party experience for any occasion. 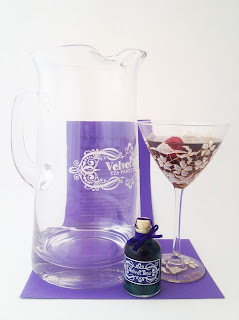 However, Emma felt that a bespoke cocktail would be a perfect addition to the Velvet Teas menu and would enrich the whole experience for her ladies. The criteria this cocktail had to fulfil were manifold. First and foremost, it had to have universal appeal. As Emma's clients are almost exclusively female, this meant finding something with mass, feminine appeal. Next, it had to be easy to prepare as events are very busy and nobody wants to wait half an hour for a drink to be ready. 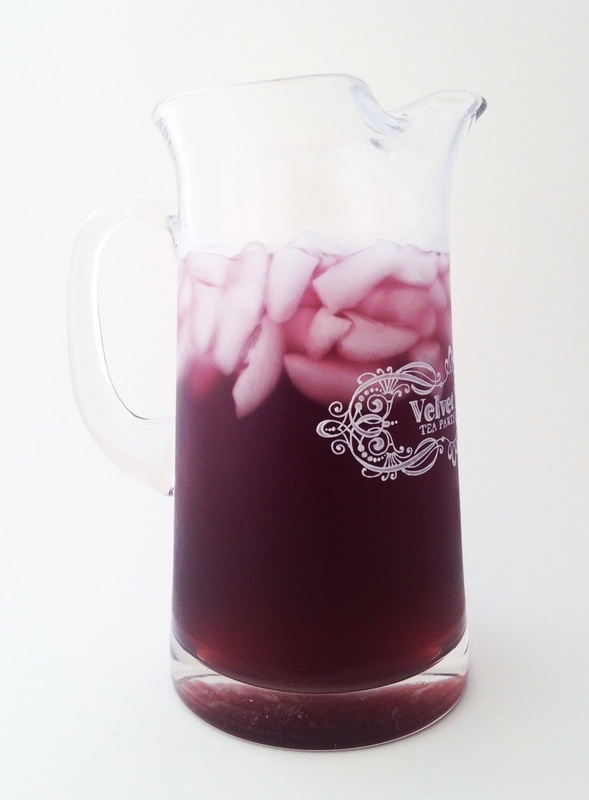 For this reason, it was decided that it should be a cocktail that could be made in a pitcher so that large groups could all order it without sending the catering into meltdown! Despite being a pitcher based drink, it still had to be served in a coupe style glass which meant it couldn't be served over ice, like a highball. 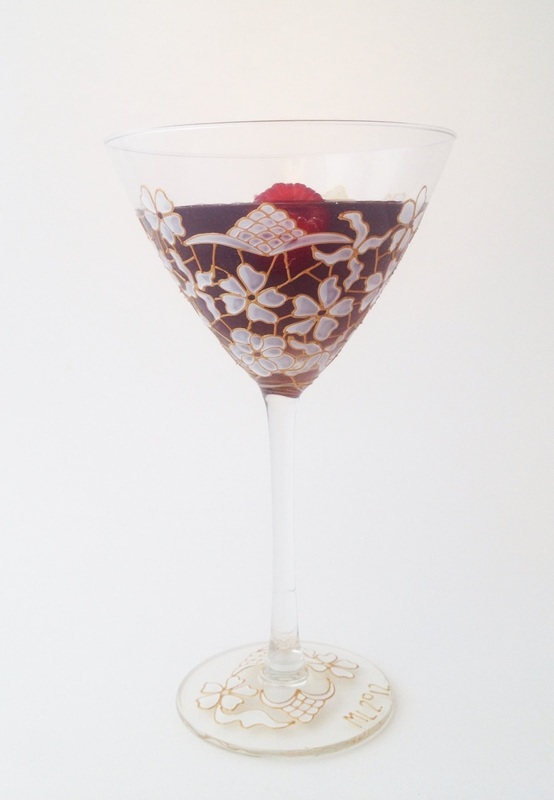 It was also important to create a cocktail that went well with cake, so it had to be sweet without being sickly. 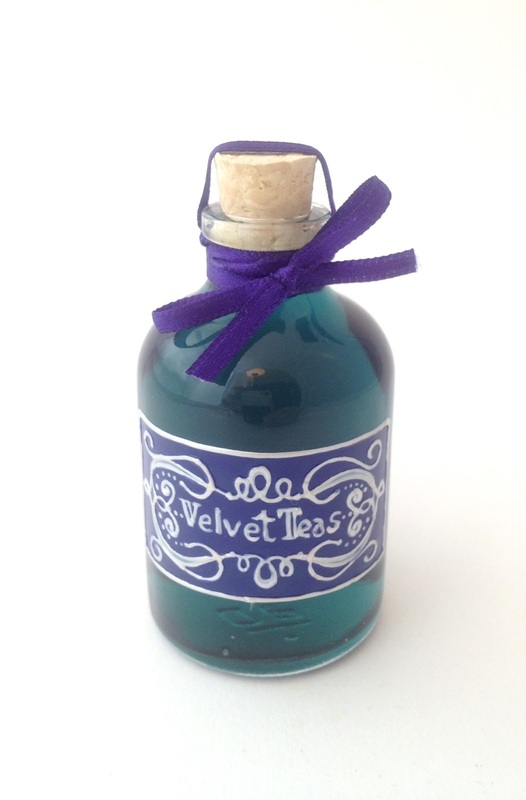 Finally, and crucially, it had to be purple, so as to make it relevant to the Velvet Teas brand. Many purple cocktails later, the Raspberry Velvet Tease was created. It's a fruity and fresh blend of Gin, creme de framboises, cranberry and lemon with the addition of blue curacao to give it the desired, purple hue. The recipe can be adapted to make a martini style cocktail, a highball or a pitcher, which is perfect if you are thinking of having a party. As with all the Bespoke Cocktails I create, the final recipe is accompanied by a hand painted miniature bottle with the alcoholic part of the cocktail, a recipe sheet and a hand written letter to fully explain the thinking behind the choices. 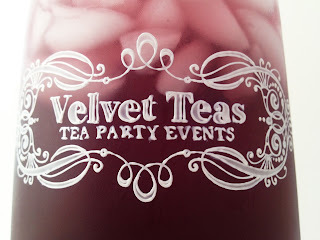 In the case of Velvet Teas, I also hand painted a large pitcher that will be used for serving the Raspberry Velvet Tease cocktail at their tea party events. 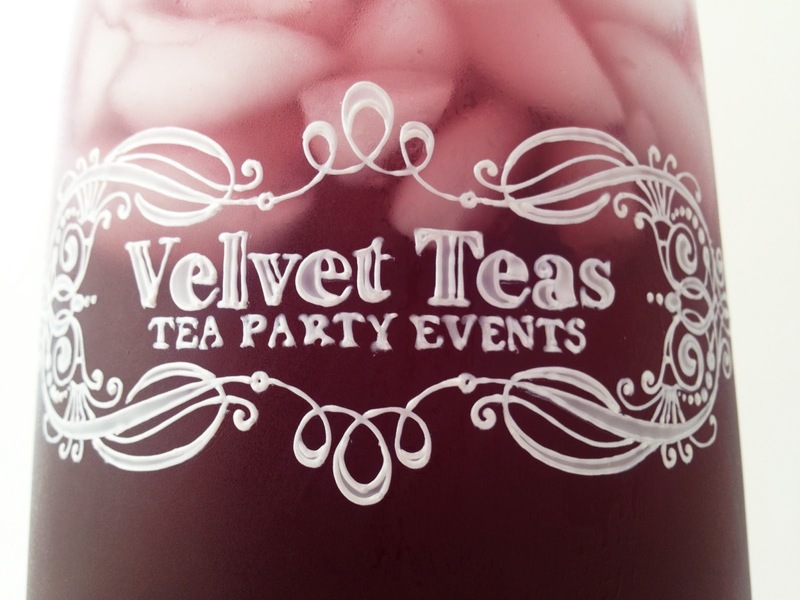 If you would like to find out more about Velvet Teas and the wonderful events they can provide, then please click here to go their website. Add all of the ingredients apart from the sparkling water, to a large pitcher, with ice. Use a long handled spoon to stir the ingredients well, for about 20 seconds - it is important to get the drink as cold and as well mixed as possible. Add the sparkling water and give another short stir to mix - not too vigorous this time or you will lose the fizz. Strain the cocktail into martini style glasses to avoid including any ice.